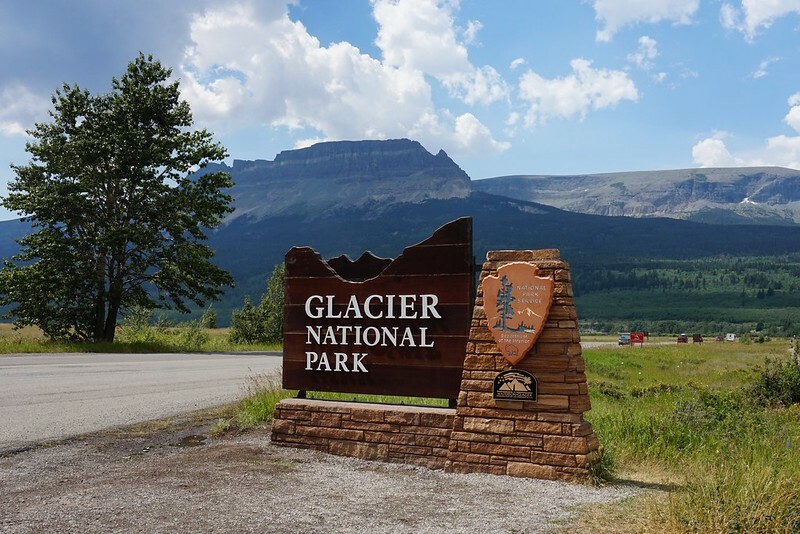 Roadtrip 2014 – Glacier National Park, Montana – vegan in your city. 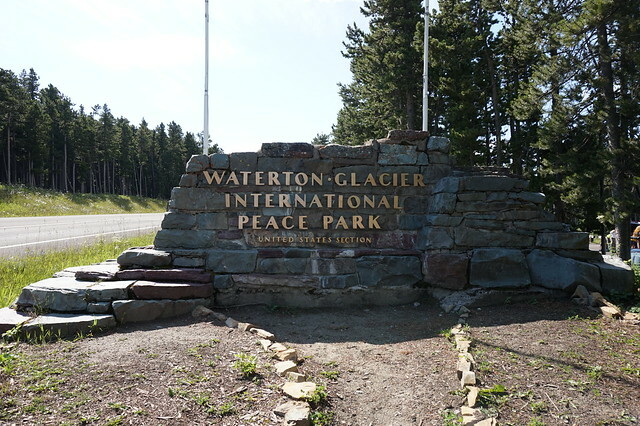 Driving away from Waterton Lakes National Park in Canada – we passed through Chief Mountain Border Crossing, it’s an incline to get up there, followed by some rolling roads. It’s a lonely looking station, but one fits in with the surroundings with stone and wood accents, and a gruff agent was working the booth. 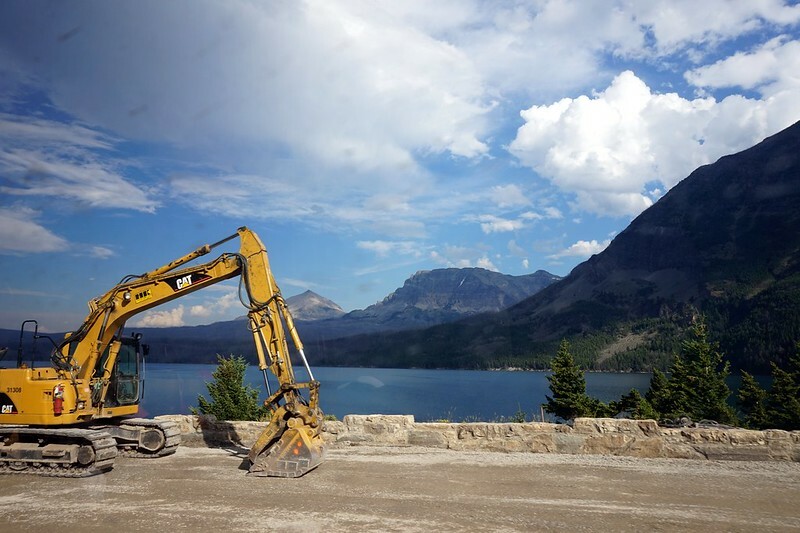 He asked us what our destination was – which was hard to pinpoint really depending on how far in the future we wanted to look – but more immediately our focus was on Glacier National Park and Yellowstone National Park. He told us to have a good time and sent us on our way – we would not be back in Canada for a bit over 3 weeks. Yes, here I am continuing my series of posts from our Summer Roadtrip in 2014, in the belief that it’s always better to be late than never, you can see some of the past posts on this helpful board on Pinterest, or just click on the Roadtrip 2014 tag to peek at some of our past summer adventures sightseeing and eating delicious vegan food across Canada and the USA. I have some stories to tell, and at bare minimum I want to write them out so I remember them a few years down the road. 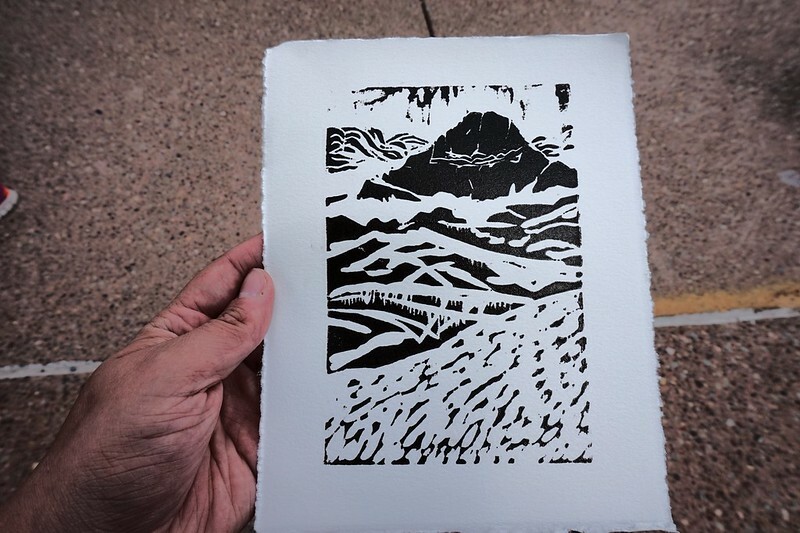 When we arrived at the visitor center, there was an artist in residence Whipplesmith Plank (http://whipplesmithplank.com) running a free ink stamping activity… it was ostensibly for kids, but we participated too, and still have a couple of prints from the day as momentos. After our fun stamping activity, we drove over to our campsite – we’d decided on the Cut Bank site, which is on the east-central side of the park. We were advised by one of the rangers at the visitors center that it would be more likely to have campsites available than some of the closer areas (they were right). It was lovely with a peaceful atmosphere, surrounded by trees and shade, and great for tents. It was just off Highway 89. Highway 89 took us on a terrifying journey around tight curves that followed closely along the hill sides in some places. It would be a preview (though a much tamer preview) of what we’d experience on the Going-to-the-Sun Road the next morning. 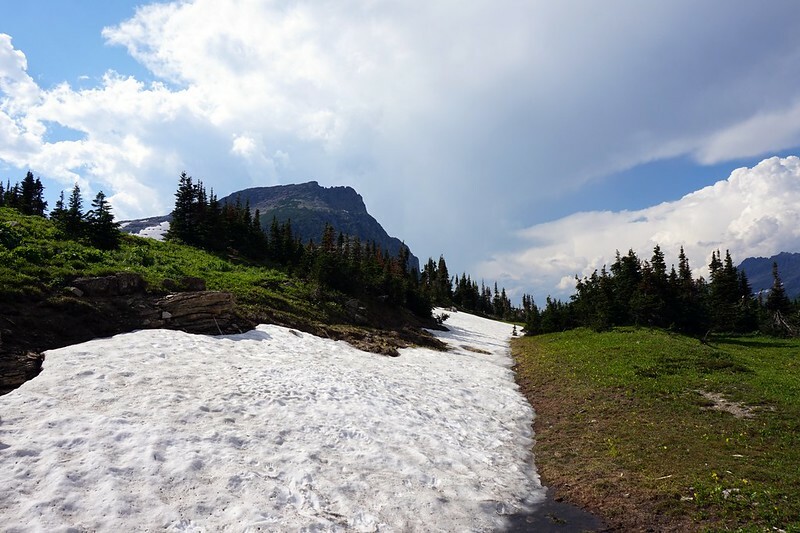 There are hiker shuttle busses that go up and down Going-to-the-Sun Road several times a day, and are also used by non-hikers to go up the mountain without being responsible for driving up (or down.) It’s a great system, especially connecting a couple of the camp sites with trailheads along the road. 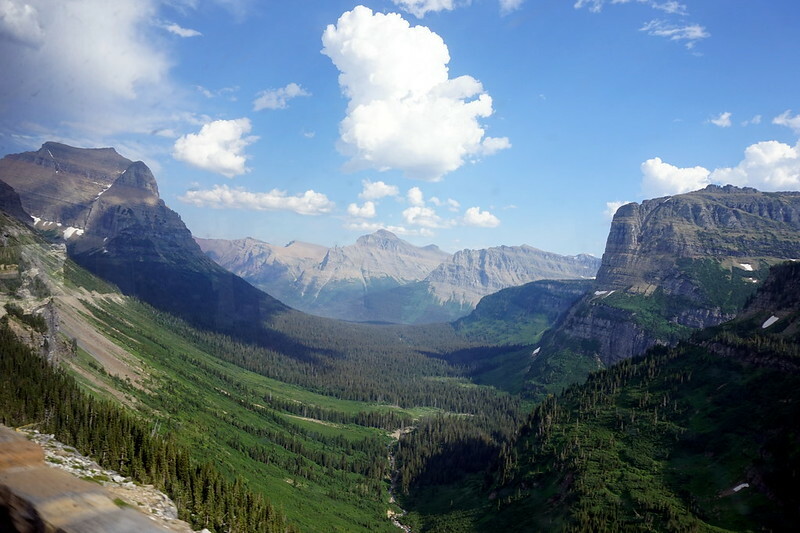 I took very few pictures or videos on Going to the Sun Road. It’s an absolutely stunning road, but it’s twisting and narrow, with deep drop-offs to valleys below – so very logically I was convinced if I leaned too far towards the window we’d fall off the cliff. 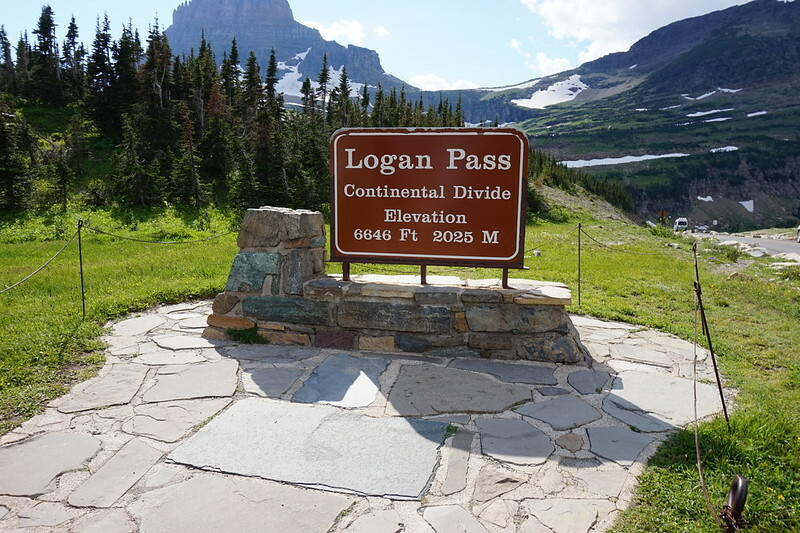 It’s the only road that crosses the park, going over the Continental Divide at Logan Pass. We got off the shuttle here to check out the site and to look at snow and mountain goats. 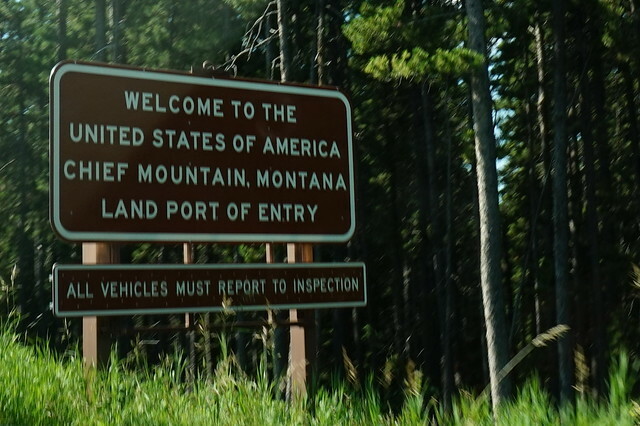 We’d see the continental divide repeatedly on our trip, so every time we’d try and snap a picture of the sign. This was at the Logan’s Pass Continental Divide point at an Elevation of 6646 Feet (or 2025 m). The Continental Divide of the Americas (also known as The Great Divide) is a hydrological divide that separates the watersheds that drain into the Pacific Ocean from the river systems that drain into the Atlantic ocean. The Logan’s Pass shuttle stop also has a visitors center. 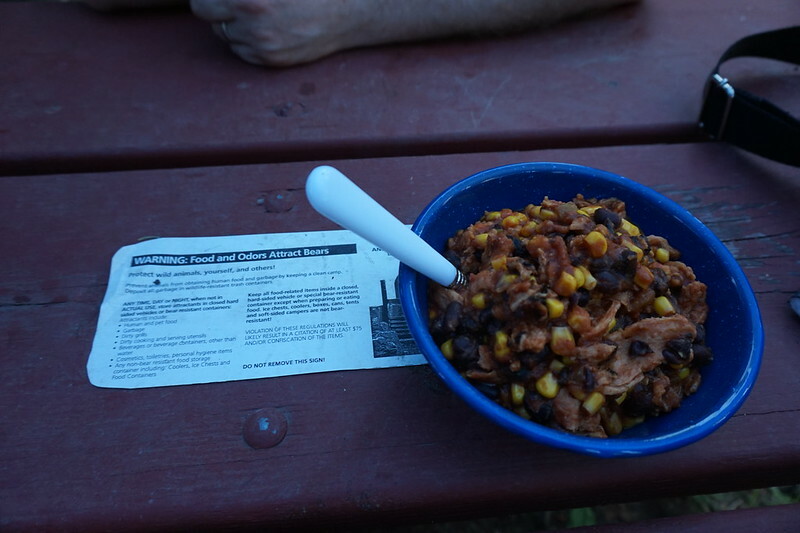 While we were eating the fire cooked soy curl and black bean and corn concoction (pictured below), a park ranger in full uniform, with aviator shades, holding a rifle came over to our site to let us know that there were multiple bear sightings (“there’s been bears” – ranger with western accent) near our campsite and to be careful. * If you’re camping, remember to bring a water container. Our campsite did not have water on site, and that’s not uncommon. Our next stop after would be in Helena, Montana to stock up on food for our stay in Yellowstone National Park.